Previous straw celebrities at the festival have included President Michael D Higgins, US president Donald Trump, singer Imelda May, and characters from Game of Thrones and Harry Potter. 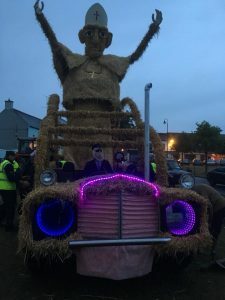 A giant Pope Francis scarecrow – complete with popemobile, security scarecrows and spectator scarecrows – is the centerpiece of this year’s Durrow Scarecrow Festival. 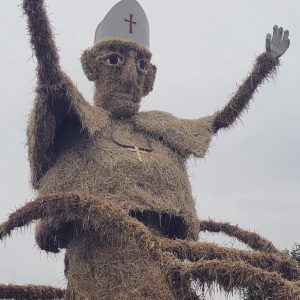 The straw scarecrow was made to celebrate the visit of Pope Francis, which will happen later this month. The famous scarecrow festival, held in Durrow, Co Laois, is a community event. It depends on volunteers, and everyone gets involved. The local church and school car parks are made available for visitors to the event. The artistic depiction of the Pope was created by the Conahy Vintage Club. Club chairman Michael Bergin told RTE news club members wanted to make something topical for the scarecrow competition, which is part of the festival. They came up with the idea of the Pope standing in the popemobile and waving at the crowd. The club is famous for winning the All Ireland Scarecrow Championship with its giant entries. In previous years the club produced King Kong and an elaborate Noah’s Ark. Now in its ninth year the festival has had famous straw visitors before, including US President Donald Trump, and President Michael D Higgins and his wife Sabina. While performing in nearby Kilkenny, the singer Imelda May was delighted to stop and pose for a selfie with her own straw twin. Topical political issues are depicted with cheeky scarecrows, as are the films and books of the moment. In past years, characters from Game of Thrones and Harry Potter have made appearances. People of the town begin work on their scarecrows as early as January, and the first few months of the year are filled with scarecrow-making workshops. Participants work on entries for the competition, as well as scarecrows to decorate the town and enhance what become the event of the year. Money raised by the event has enabled the local community to fund a community hall. The festival finishes on August 6th.